To respond to the increasing demand for themed fairy tale weddings, Disney Development Co. developed a nondenominational Wedding Pavilion to seat 250 guests for weddings as well as other family celebrations. 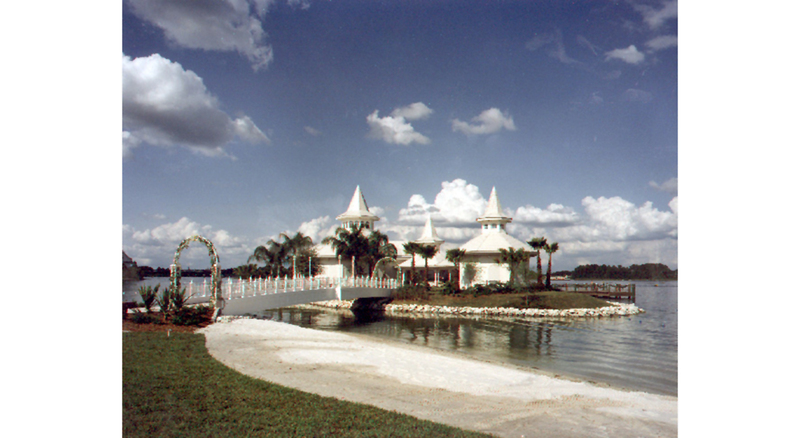 Located between the Grand Floridian Beach Resort and the Polynesian Resort, this building complex is sited on the lagoon with a view of Cinderella’s Castle. A pedestrian bridge to a newly constructed man-made island is designed in the turn of the century Victorian style of the facility. The Wedding Pavilion project consists of a 2,500 square foot Preview Center where the bride and groom design their special ceremony and a 6,000 square foot chapel facility. The project also features a boat dock/gazebo, parking for 125 cars, bride and groom dressing rooms, chaplain chambers, floral storage room, coatroom, breakroom, wedding related retail and guest/staff support facilities. KBJ served as Architect of Record, working in conjunction with Wimberly, Allison, Tong and Goo as Design Architects.